This poor gentleman is an instant away from impact with the planet. Most likely he slipped on the ice. The spill path, trailing from the cup, suggests his orbital path is quite vertical, the shortest distance to a crash landing. Possible injury list: coccyx, a rotator cuff or two, wrist, elbow, not to mention cranium. His spinal reflex, hardwired over the eons, has rapid-fired to protect the brain: hence, head forward, elbows and hands straining back, bracing for disaster. The system will accept trauma to limbs to protect the main frame, a sacrifice for the greater good. 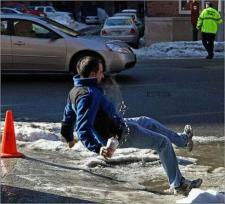 A SLIP is simply when the base (boots on the ground) moves out from under the body’s center of gravity – unexpectedly. A TRIP is the opposite — the CoG moves suddenly outside the base. The steeper the angle leading to impact, the less recovery opportunity, the greater the potential for injury. What’s the self defense application? At Double Edge we teach strikes, breaks, and throws. The goal; render the predator injured and off balance, then accelerate his mass into an unyielding surface. Nothing fancy – gross motor movement with your body weight. If the throw drives the threat backwards off his base, there is a predictable flight path – this snap shot – every time. This image freezes the physics for our consideration, understading… and survival.